We've only really just begun to sample the gory innards of Doom's juicy eyeball-popping action but there's already plenty of Easter eggs being discovered and yes, that even includes Id Software's very own version of Candy Crush. A warning, the videos and images below will contain area spoilers for Doom's campaign so if you want to go in cold, click away now. Yep, there's actually a playable match three game that'll let you mix up the original Doom monsters to get the highest score. As you can see in the above video from TestedModz, the original pixelated demons are accompanied by the classic Doom soundtrack. You'll find it in the Lazarus Labs. Thanks to the eagle eyed AwesomeAstroman on Reddit, we can see that Fallout's corporation has made it all the way into the hell spawn filled future. It's somehow reassuring to know that the world might now be filled with demons but this all takes place in the same world as our favourite apocalypse. You'll find a few of these stickers throughout the game. Doom happily skips through a sea of Bethesda references and it wouldn't be the same without this poor individual with a patella someone has been using for archery practice. Just in case you didn't already know it's Skyrim, there's no mistaking the helmet of the Dragonborn. Above image from Reddit. Of course you want to die a toasty lava packed death just to see this joyous Terminator 2 reference. Want Doom in your Doom? Of course you do. Scattered across multiple levels are secret entrances into original Doom levels where the environments are just the same as that Shareware disc you pored over in the 90s. The current monsters replace the pixelated soldiers of yore and you can even find your way up to previously inaccessible locations with that new fangled 21st century jump. Novakiller on Reddit spotted a number of sadly discarded Super Turbo Turkey Puncher 3 arcade machines from Doom 3 but don't worry, one of them is stil somehow plugged in and ready for action. Novakiller also got a shot of the below Doom and Quake posters. How very meta. 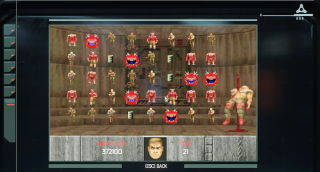 In this Easter egg recorded here by Reddit's Devastationz, not only does Doom 2's boss make a surprise appearance on the wall but shoot the right part of his head with a rocket and he'll send out a box with a Doom Guy collectible packaged inside. Double bonus. It's your hell party and you'll die if you want to. This little birthday diorama must be mocking something but for now just looks like some celebrations gone very, very wrong. Hey, at least there's cake. Know the reference? Let me know in the comments. Recognise that helmet? Oh, you do? Well that officially means you're old. Snapped by our own Dave Houghton, this head on a spike is wearing the headgear of none other than Commander Keen, Id Software's, early 1990s side-scrolling platformer for PC. Spotted in some hell lore collected by our very own Dave, this art of the Doom Guy in an ancient text is strikingly similar to the new alternative box art as well as the original art for the first game. See below for a comparison.